Although I painted this baseball mural in Binbrook, Ontario, I also sell baseball wallpaper murals that ship FREE in Canada and the USA. They’re super simple to hang and totally removable when you’re ready to redecorate! 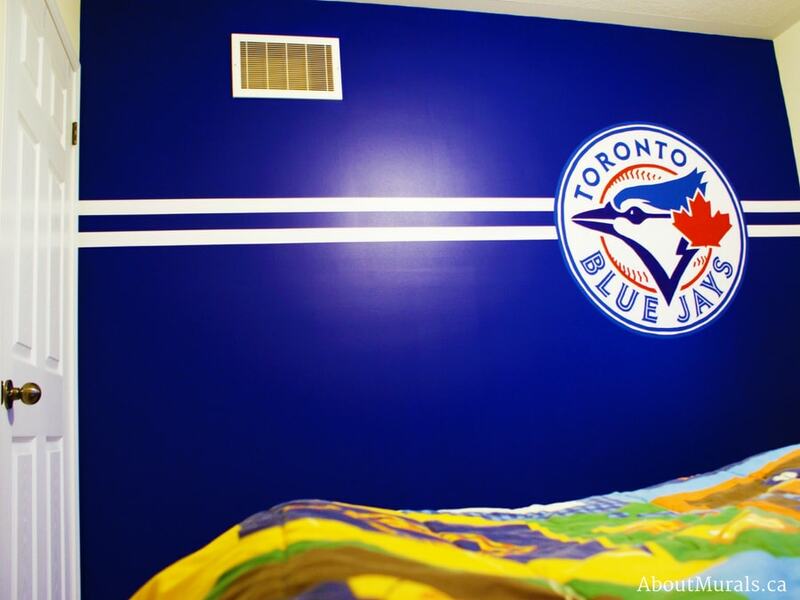 Are you thinking of adding a baseball mural to your kids bedroom (or a man cave even)? 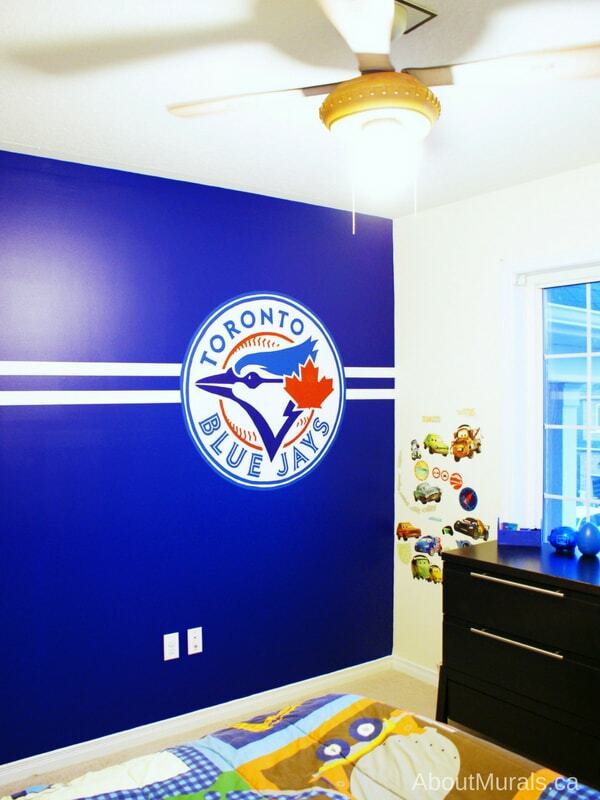 Here are some photos of a Toronto Blue Jays logo that I painted for Gavin – an amazing birthday gift from his parents. Since this was a surprise gift, Gavin’s parents didn’t have time to paint the navy blue background on the wall before I painted the baseball mural. His mom took him out for a day at the beach while I painted the background and then the Blue Jays logo. Latex painting is a service I offer before painting my wall murals, if you’re not the DIY type…but if you’d like to keep the cost low, painting the background is one way to do it. 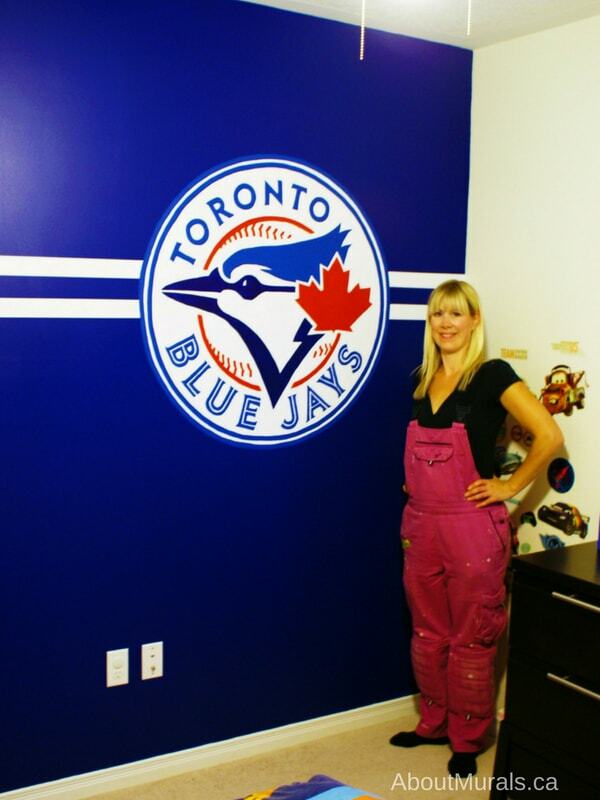 For this baseball mural, I painted two horizontal stripes on either side of the Jays logo. I paint all my wall murals using non-toxic acrylic paint or no-VOC latex paint, so it’s safe for your kids to sleep in their rooms – even on the night I finish the mural. If you’re thinking of adding a baseball mural to your home and you like my work, you can hire me! Do you love a hot coupon code, DIY Tips or inspirational photos of cool rooms? I share it all in my newsletter – I’d love to have you in my community!